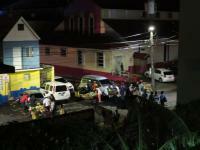 There’s a city-wide 8pm curfew and state of emergency called in response to a high number of gang-related homicides in Montego Bay. Getting in and out of the city requires going through military checkpoints, but I can’t say we saw much police or military overall. Mostly, we saw a lot of private security. Poverty, homelessness, and mental illness are highly visible and striking.